‘People say that when we’re playing on stage we tend to smile at each other a lot, I don’t know if we intend to do that but we always have a laugh.’ Says Roan Ballantine, describing the VanIves stage dynamic. Roan Ballantine and Stuart Ramage met at the age of ten when they were both campaigning for a new skate park in Galloway. It’s a long bond that’s evident in their tight on-stage dynamic, ‘we’ve known each other so long and been in bands for so long, we were in bands together at school, so being on the stage together isn’t a new thing or a strange thing. I think it works really well.’ explains Roan. The sound of VanIves, is a genre melting blend of spacious and gently soulful elements. 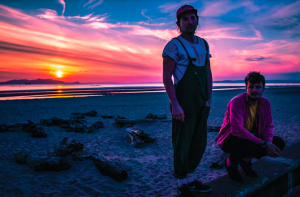 Between Stuart’s softly soaring vocals and Roans hip hop inspired and multi layered electronic production, they construct a sound that comes across at once both highly produced and natural. The VanIves project has been on the go for just over a year now, and they’ve already played some top quality support slots. Just before the summer they supported SG Lewis, Be Charlotte and then Tokio Myers for two nights at the Queens Hall. We’re just trying to bring the EP together to the best of our abilities, we do everything by ourselves. We record a lot in the house but I did a course at Chem 19 just before the summer and learned how to use a recording studio. So we now go there to record a lot of our vocals and drums and stuff.’So what’s next for the band? ‘We’ve a gig coming up in Edinburgh on 10th October, I think it’s our second headline show in Edinburgh. So we’re gearing up for that, thinking about how we can make it a bit better than last. Live we’re hopefully getting a drummer on board, we’ve been chatting away with him for ages, we’re good friends. Hoping to get him in for festival shows or maybe more.